Northern California Escapes – the best NorCal AirBnB listings – Running + Crying, Mostly. I fell down a rabbit hole of love for my own great state recently as I started planning my 27th birthday. Clicking excitedly through Northern California AirBnB listings, I felt increasingly overwhelmed by all of these pieces of paradise that I haven’t experienced; stones of weekend getaway perfection that I’ll have to leave unturned (only because it doesn’t make financial sense to try a new bohemian treehouse/coastal cabin/glam yurt every weekend). There are just so many places — all totally unique from one another! — that I want to go and explore. I see myself reading in light-drenched rooms, drinking coffee on misty decks among the redwoods, rolling out my yoga mat on blonde wood floors in mid-century beach homes. So, instead of lamenting about my waning time on this planet while drooling over these listings, I thought I’d crowdsource my experience — I’m going to turn this list over to my friends in hopes that through you all, I’ll get to experience some of these beautiful, rustic, wild, magical places. So, the list lives here (I Love Northern California), but I thought I’d share some of my favorites on here, too. I kept it pretty reasonable in terms of price, so most of these places are actually pretty accessible for an impromptu weekend away. Feel free to add suggestions in the comments if you think I’m missing something. Starting off strong with this dreamy, hip little slice of South Lake paradise. This list wouldn’t be worth its URL if I didn’t include a perfectly rustic chic Tahoe cabin. From the southwestern-y details to the updated appliances, this is an upgrade on the typical musty 1960’s cabins of my childhood (but like… I still love that musty cabin smell). There’s Greek-ish, palatial paradise in them there hills! This is a dreamy little private room with a turquoise pool, views, and unbelievable light throughout. I imagine wearing a flowy white dress, eating fruit, and letting the sun warm my arms. This is the place to go if you want to be totally transported to villa life without leaving the bay area. Hammock? Check. Deck with a view? Check. TREE SEAT?! Check. If you’re intrigued by “tree seat”, or if you just love the idea of a wine country cottage close to the Carmel seashore, try to find some availability at this gorgeous piece of mid-cal paradise. I love it because it oozes that french barn rustic elegance while still feeling like classic CA wine country. Did I mention there’s a hot tub? I just sold myself while writing this — I’m booking it right now. While Willits might not be the first place you think of when you start brainstorming your weekend retreat, the views from this home are otherworldly. From an observation deck, you can gaze at unencumbered stars, mountains shrouded in mist, and any number of magical things, I’d assume. Quintessentially cabin-y, I’m pining (get it? like, pine trees? okay.) to steal away to this classic little Russian River A-frame. Does it get any cozier? 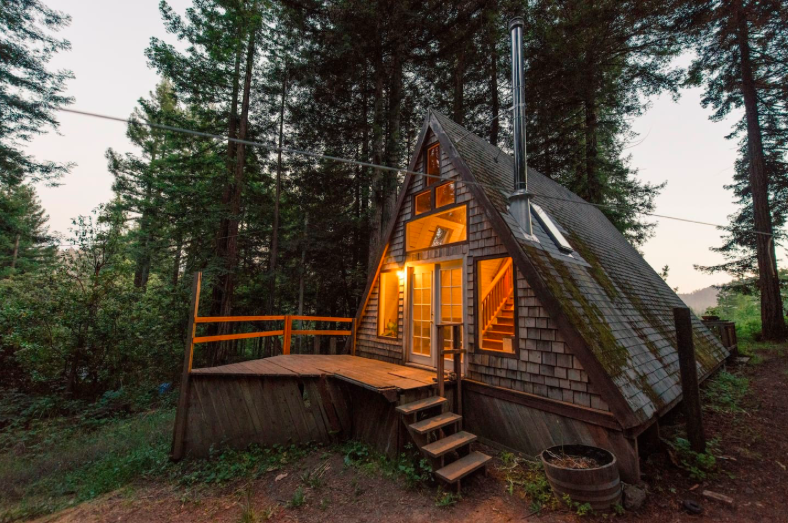 This little redwoods getaway is a little more bare-bones than the other options, but at $138/night for the entire thing, this love shack is a steal if you’re looking for some fresh northern air. Have you heard of the Mushroom House in Santa Cruz? On the off chance that you can find a weekend where this little piece of hippie paradise isn’t already booked up, you should by all means make the trek to Santa Cruz. Nestled in the serenity and magic of a redwood grove, this dome is surrounded by a deck, from which you can observe hummingbirds as they grace your life with their humming cuteness. Don’t like hummingbirds? Okay, you monster, you might still be able to appreciate the beauty that is a geodesic dome in a coastal rainforest. That is all. Monte Rio is a little town on the Russian River, and the site of my next weekend getaway. This cabin is perfectly and thoughtfully appointed with amazing details and plenty of coziness. Yep. That Inland Carmel Romantic Getaway property is to die. Did you go yet? I’m adding it to my AirBnB list, fo sho.